In this section we propose our customer insight into the Axarquia on five routes. Routes, declared of Tourist Interest in Andalusia, which will make you live all the wealth of this district and thirty-one municipalities. Inside Axarquia between the slopes of the Natural Park of the Sierras de Alhama, Tejeda and Almijara are a number of white villages, who still retain their Muslim heritage. These villages, indifferent to time, are perhaps the most intimate and authentic to the region. Visit of the coastline of the coast of Axarquia, with a natural environment of great richness and variety. Because of its climate and situation is common to find abundant crops of avocados and tropical fruits such as mango, papaya and custard apple. This route combines the best of the coast and the interior, combining tourist frenzy and rural peace. This proximity to the beach will mark the qualities of the Ruta del Sol and Wine forming a duality that manifests itself in all its cultural aspects. This route runs through the Sierras de Tejeda, Alhama, Enmedio and Jobo. Offering a unique landscape of mountains, where olive trees and pastures predominates. This understood by those peoples whose main production is oil “verdial” variety, one of the best in the world, by their values ​​for health, with a special and different flavor. The landscape of this route, located in the center of the Axarquia appears dominated by fields of vines and drying raisins. The climatic and geographical conditions of the area make it excellent in both the cultivation of authentic goes Malaga, as in the production of the famous sweet wine “Muscat”. 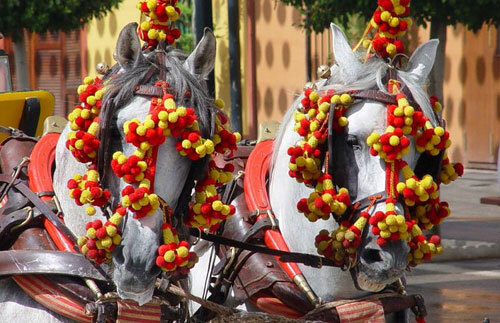 There are more than 160 Festivities in the region of La Axarquia. Among them, 15 are recognized Tourist Singularity and therefore of special interest to you. Ask at our reception or the relevant City for the dates and specific programs that might be interested. Enjoy the cultural, culinary and entertainment offered by our tourist offer.